Maybe they let the moment get to them, maybe starting slow became a bit too familiar, but one thing is for sure: Country Christian's boys' basketball season has reached its conclusion. The Cougars met with Grand View Christian Academy for a third time in The Valley 10 League's playoffs to determine who would make it into the state playoffs. Despite defeating the Eagles on two different occasions, Country Christian was unable to repeat the feat for a third time. Grand View defeated the Cougars 50-40 on Tuesday, Feb. 12. "We went in confident that we could beat them, but there were some nerves," Country Christian head coach Dawson Nofziger said. "They're tough though, and they'll outwork you." Country Christian dug itself a hole early in the first quarter, falling behind and not putting its foot on the gas pedal until the second quarter. According to Nofziger, slow starts are something that has plagued the team all season, but may have been influenced by the playoff atmosphere. "Apart from (seniors) Drew (Halverson) and Sean (Gilmer), the playoffs were foreign ground to a lot of the players," Nofziger said. "I think traveling to a bigger gym in front of loud crowd, searching for a third win against a tough team might have gotten to them a little bit." While the team initially fell behind, they were never out of the game. Bench player and freshman Cooper Halverson helped to keep the squad in it, contributing 14 points in his minutes played. And despite the Grand View defense looking to shut down Drew Halverson, the senior put in a quality effort as well. It was too much at the end of the day though, as Country Christian saw it's season ended with a 14-11 record. The run ended Nofziger's first full season as the Cougars head coach. Despite getting some time in while his father and previous head coach Doug Nofziger was away, this was still a new learning experience for the first year coach. "The biggest lesson was learning that each team is different," Nofziger said. "This team plays faster and looser in a zone defense, and I initially had them playing man defense. I switch it up and it got them going. Managing and figuring out the team was a big lesson I learned." There were a series of moments that stood out for the new head coach and his team, one of them being the first game of the season against Eddyville Charter. 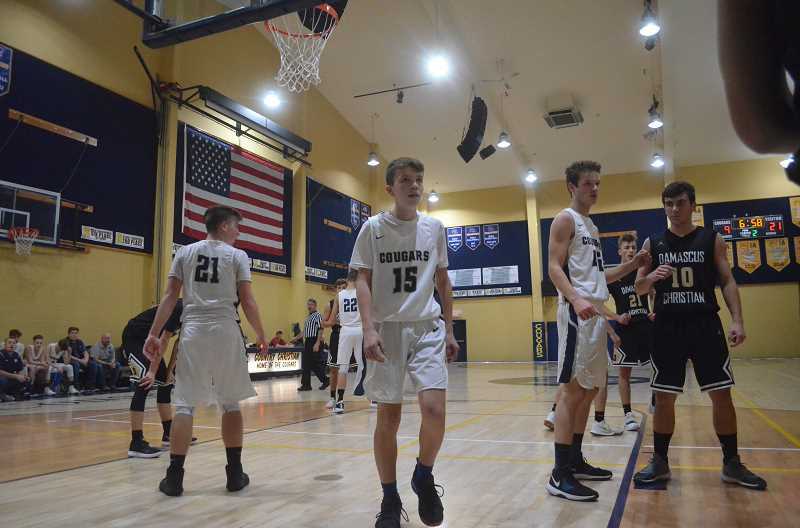 Country Christian won in overtime 65-59, and the team had pulled together seven wins by 10 points or less and the excitement Nofziger saw in his team each time was something to behold. There was a real sense of achievement after one particular game though. "When we matched last year's win total in just seven games, there was a sense of relief from the boys that we could move forward," Nofziger said. Country Christian won just four games in the 2017-2018 season. "I told the guys (after the third Grand View game), 'I couldn't have asked for a better first team,'" Nofziger said. "They soaked up all the coaching and put it all on the line. I was blessed by their chemistry, and how they worked to get better. I was very fortunate."